Alice is in rehabilitation because she is very leery of new people and her fear can cause her to be less than friendly until she trusts you. High quality treats and time help her learn to trust new people. There are several volunteers at the rescue who walk and play with her and there are always volunteers working to get to that comfort level with her. She is an amazing dog that loves to run and play fetch. Boomer was found on the hood of a car in Harrisburg and he has been at Speranza for over a year. Boomer is slow to trust new people and he really needs work on his leash skills. He thinks a leash is the ultimate tug toy and plays hard! He is great with dogs and loves to play fetch. Diego was found alone on a porch in Harrisburg. He loves other dogs and gets to play with three other dogs every day. Diego does well on walks and can be handled by most of the volunteers; however Diego does not do well with people in his face or on his level. He has acted out before, but he has been doing very well for the last several months. Our sweet, little Elmer has had some issues when encountering people. He is sweet and affectionate to most, but he has had his moments where he loses his manners. He grew up in a foster home with other dogs and children, but for some reason he lost his confidence along the way. Elmer is adored by the many volunteers that walk him and give him love. Gordon was found wandering around after his owner tried to sell him on Facebook. He was not too excited to see strangers trying to help secure him and get him to Speranza. He allowed Janine to leash him and bring him back to the rescue. 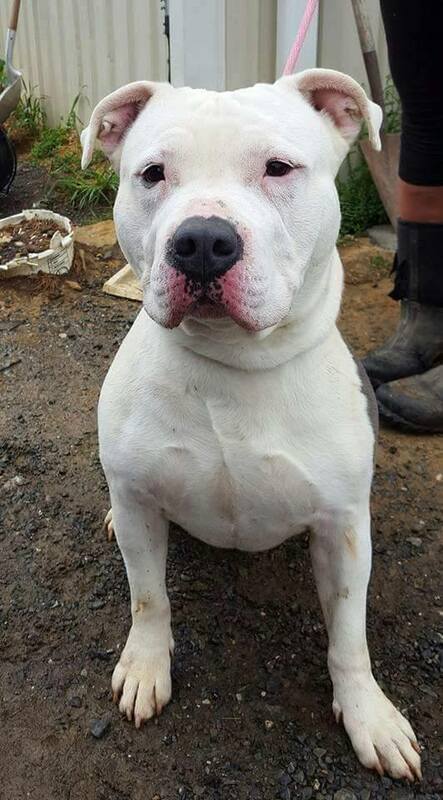 Gordon has opened up enough to trust a very limited group of volunteers to handle him. He is protective of his handlers and we are working to help him understand that everyone around is here to help him. This blue-eyed heart breaker was brought us as a stray by our favorite dog warden - Barry. He is estimated to be 2-3 years-old and he is as goofy as they come. Barry has trust issues with men and can be a tad moody, but is good with most women. He is a very social dog when it comes to other dogs. He loves to play with other dogs through the fences at Speranza. He is always smiling and making the volunteers laugh. He is not graceful, but he is very lovable! Jefferson came to Speranza with severe chemical burns and deep wounds all over his body. He spent several weeks at Dillsburg Veterinary Center receiving care and lost an eye in the ordeal. He is very affectionate and stubborn. He walks when he wants to and he demands belly rubs when he wants them! Jefferson is walked by all of the volunteers, but we are all careful to stay on the side where he can see and to stay out of his face. Jefferson has acted inappropriately more than once and we are trying to determine the trigger of this behavior. Jersey Boy came to Speranza in late February of 2017. He could only be handled by the Animal Control Officer that helped save him at the shelter in New Jersey. Now at Speranza, he is only being handled by Janine. He is slowly coming out of his shell and starting to enjoy life with Janine. He is still very leery of anyone else, but he will come around in time. Karma has been at Speranza for some time now as she is slow to accept new people and new environments. Karma is one of the sweetest dogs to those that she trusts, but she is fearful of strangers and reactive when around them. She is also a terrible leash biter and struggles to accept that a leash is not a tug toy. She absolutely loves her time playing with the other members of the ‘family circus'- Diego, Tucker, and Boomer. Monkey Joe is the one dog who’s resource guarding we have not been able to break yet. Monkey is a very sweet, smart and stubborn boy. He does not like anyone near his food, toys, or other objects that he decides to guard Monkey is a fantastic communicator and always let’s you know when he is uncomfortable, which makes respecting his space very easy. Monkey loves to play with other dogs and he is a volunteer favorite. He insists on getting belly rubs and often refuses to walk until he is satisfied with his ‘tummy time’. 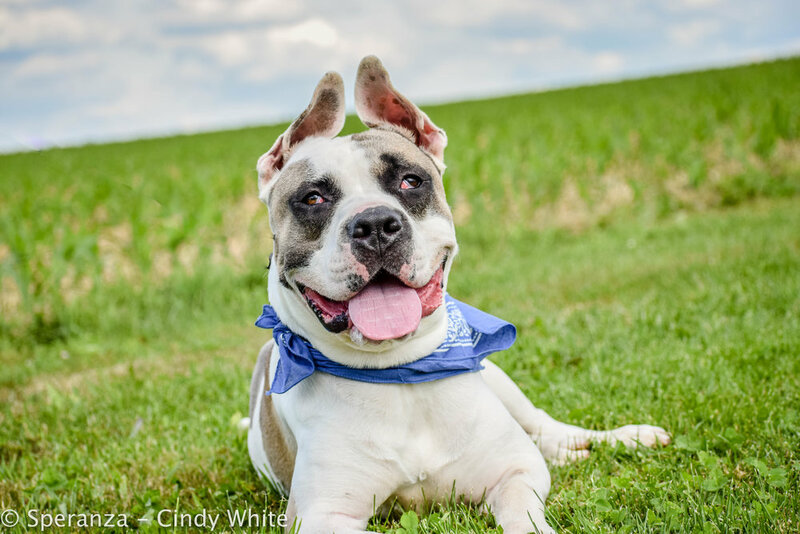 Our big, dopey Dexter is striking with his big ears, goofy smile and beautiful coloring. He was estimated to be between 1 and 2-years old when he was found as a stray in Philadelphia. He is a Great Dane mix and has some hip dysplasia and knee issues for which we are treating him. He is very dog reactive but loves to play with tennis balls. Dexter has also shown some uncertainty towards men. Marlene was surrendered to Speranza in April of 2018 and she was not too happy about it, to say the least. We were not told the entire truth about her and it was a rough first week or so. She was extremely scared and shut down - but also aggressive. It took Janine days and days to be able to see any signs to trust, but she eventually calmed down enough to be walked and handled. Marlene is only walked by a few volunteers and is still very untrusting of most people. However, she is happy and healthy and has all the time she needs. 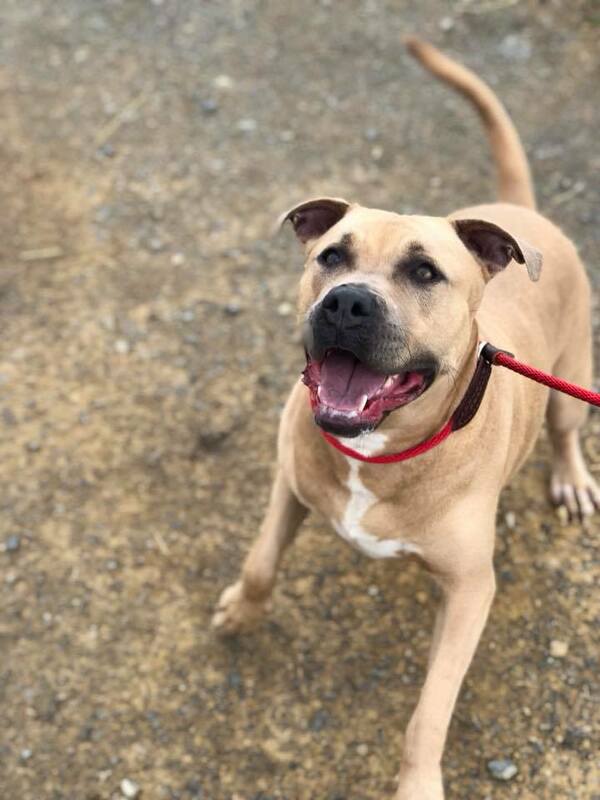 Mikey is a 7 year-old Pit Mix who was living on a chain with no shelter in Harrisburg over the winter of 2017-2018. A volunteer spotted him, altered Janine and the rest is history. Mikey needs more socialization, especially with men. He is a good dog, but has his moments when he forgets how to behave himself. Mikey does like female dogs and doesn't seem to mind cats. 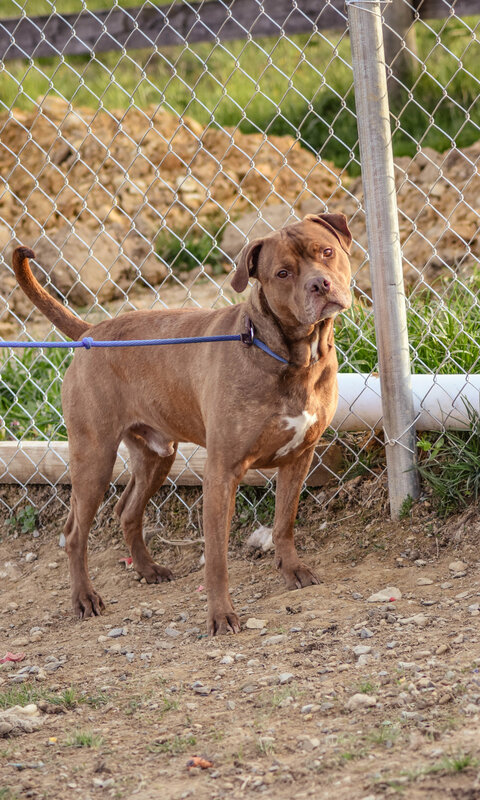 Hudson is a handsome 5-year-old Pit Mix was lived in a junk yard for 2 years in New York. He wasn't getting much socialization and started showing some resource guarding behaviors. He is now at the farm and doing very well. We are working through his resource guarding and leash manners. He is a very cute and playful boy, but he is stronger than he knows and plays rough.